Yep, it may have been a long time but I'd like to remind you of the joys of the deckchair. For, you know, sitting outside on. 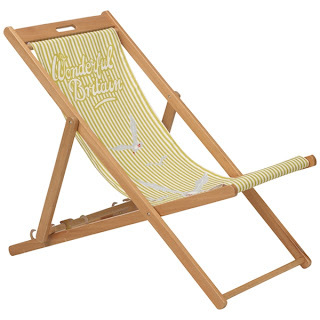 The sun has finally FINALLY got its hat on, so here's my selection of my favourite deckchairs to help you relax and enjoy the warmth while it lasts (I'll probably be showing you wellies this time next week). For such a cause of celebration, only the prettiest chair will do. 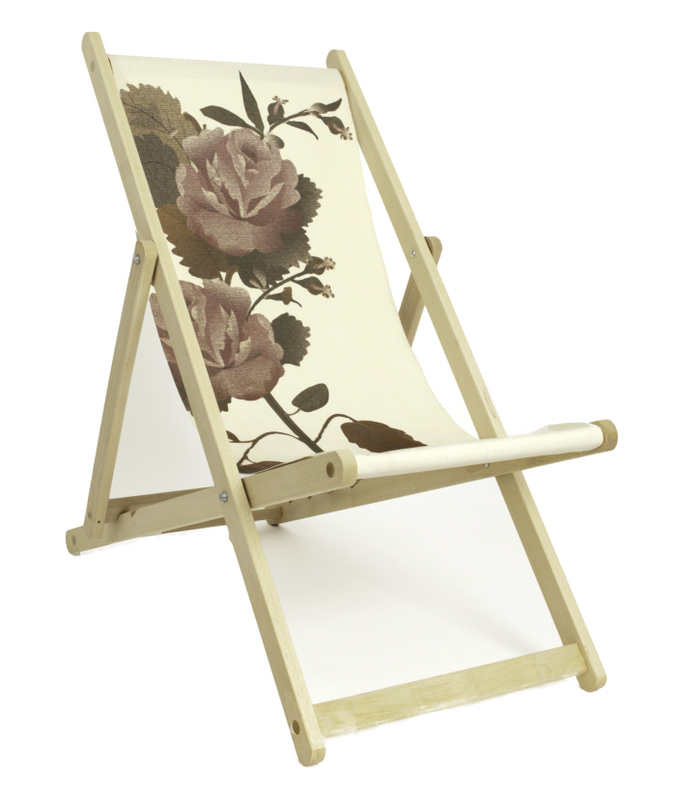 We wrote about the Lizzie Allen Habitat range a while back but the range now also includes her deckchair sling. It's got buses and the Eiffel Tower and gentlemen in uniform and all the things that make Lizzie's designs great. And it's only £10. Well, the sling is. The frame is £40 but once bought, it's usable with any Habitat sling that takes your fancy. 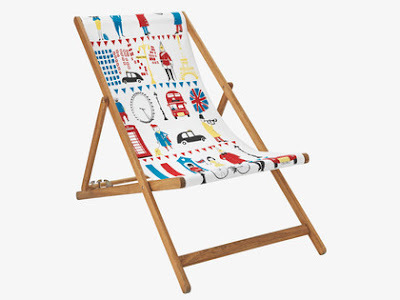 Wayne Hemingway and co. have done a whole line of deckchairs especially for John Lewis. While some of their Jubilee-inspired designs are just not my cup of Royal tea, the seagulls and misty-eyed patriotism on this number are rather pleasant. It will cost you £55. Cornwall is a strong contender for number one place I'd like to be in Britain in the sunshine. 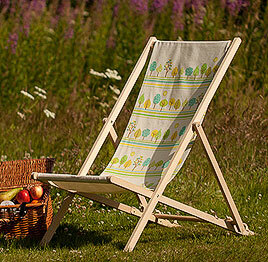 Surely no surprise that that their Eden project shop stocks some very pretty deckchair designs, with a canvas showing lines of pretty trees designed by local artist Ley Honor Roberts. These are the cheapest chairs of the bunch too: buy one for £35, or - if you are sociably inclined - a pair for £65. And moving from the cheapest chairs to the most expensive at £125 (I do also love this double deckchair design from Pedlars, but with a price tag of £495? Sorry, no. ), this vintage rose design from Furniture divas. Its gentle colours and old fashioned floral image would sit pretty in gardens, patios or whatever scrap of outdoor space you can grab. All that's now missing is a good book and something tasty to consume (try this). Oh, and for the warmth to last a little bit longer ... please?